Canadian CD 102 ponies are a favorite of many insulator collectors because they come in many varieties and colors. Canadian Pony Insulators One Collector's Research is the culmination of over twenty years of collecting and comprehensive research by the author, pertaining to all known Canadian CD 102 ponies. What a Canadian pony insulator collector needs to know about Canadian Telegraph and Telephone history. 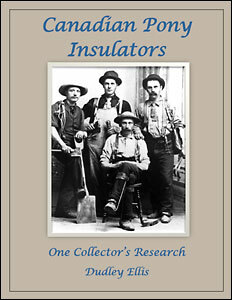 What a Canadian pony insulator collector needs to know about Canadian glass houses. Canadian ponies’ glass colors and inclusions. The invention of the pony insulator. No embossed Canadian ponies made in two part molds. The four mold styles of Diamond embossed pony insulators. Canadian CD 102 ponies embossed with telephone company names or initials, city or country. Full color page showing twenty different colored Mold Style I single diamond embossed ponies. Payments may be made by checks payable to the author from a U.S. bank, U.S. Money Orders, Canadian Postal Money Order or PayPal. Contact the author for shipments to other countries.